When your skin is stressed, look no further than a seaweed facial. This purifying, enriching facial treatment is the stuff of your skin's dreams. Ideal for all types, but especially for those with dry, dehydrated skin, the French-born seaweed facial is a healing, detoxifying and nourishing treatment that gently tones and firms at the same time. Seaweed is rich in beneficial minerals, vitamins, amino acids and trace elements. In fact, seaweed contains virtually every mineral found in the ocean - a concentration nearly identical to the minerals found in human blood. The positive effects of seaweed on other health conditions - including menopause relief and prevention of birth defects - has inspired a legion of skincare products and spa treatments, including the seaweed facial. Through a calming process that often consists of several steps, the facial works quickly to reveal smooth, refreshed, glowing skin. It infuses the skin with a "diet" of minerals and vitamins, which eliminate impurities and toxins and leave the skin soft and hydrated. If the promise of vibrant skin isn't enough, consider this: Greek mythology suggests that Aphrodite, the goddess of love who rose from the water, owed her beauty to the plants of the sea. Her dewy skin may just be advertisement enough for this nurturing, pampering treatment. Enriched Seaweed Mask: This rich mask application does not include a full seaweed facial, but provides similar benefits in a shorter span of time. Designed for all types of skin, the enriched seaweed mask softens, hydrates and repairs damaged skin cells. The face is left revitalized, glowing and refreshed. This quick treatment takes about 15 minutes to complete. An added glycolic peel will add time to the process. 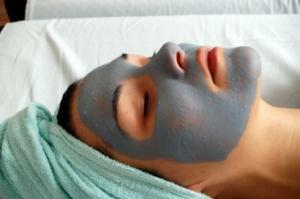 Four Layer Seaweed Facial: Layer upon layer of fresh European seaweed is applied to the face. As it infuses the skin, it works to revive, tone, hydrate, purify and firm. The four layer treatment includes a deep cleansing and massage, a cooling seaweed mask and a mineral-rich thermal mask. This facial typically takes under an hour to complete. European Seaweed Facial: The title doesn't do justice to this pampering treatment. There are several different types of European treatment "models," each encompassing a variety of different masks, cleansers and massage techniques. A common European version found in spas around the world is the Repechage treatment. The skin is deeply cleansed, steamed and exfoliated with a gentle honey almond mask. The almond granules release dead skin, preparing the face for the seaweed facial. After exfoliation, a Vitamin C-rich seaweed serum is massaged into the skin, followed by a seaweed mask. The skin is left rejuvenated and refreshed. This facial usually takes anywhere from an hour to an hour and 15 minutes to complete. Mario Badescu's Seaweed Nourishing Essentials kit is a gentle collection of products containing seaweed extract. In addition to luxurious hand and body moisturizers, this kit includes a kiwi facial scrub, which contains granulated kiwi seeds and bits of seaweed. These ingredients join forces to gently slough off dead skin cells, preparing the face for the seaweed cleansing soap and toner. Follow it up by massaging Badescu's oil-free Seaweed Night Cream into the skin. This non-greasy emollient pampers the skin, leaving it exceptionally hydrated. Dermalogica's Extra Firming Booster is a concentrated serum that targets fine lines. Its unique combination of active botanicals, vitamins and protein form an alliance, firming the skin, restoring moisture and diminishing the appearance of wrinkles.